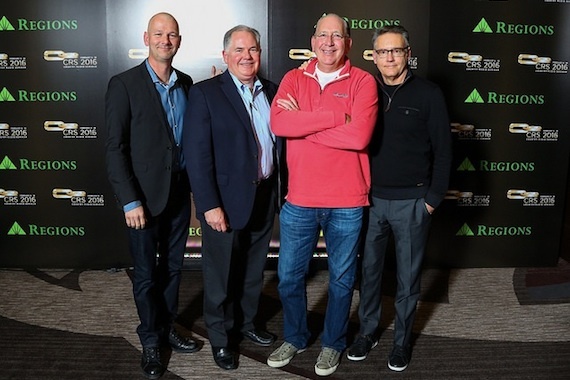 Pictured (L-R): Rod Phillips, iHeart Country; Bill Hendrich, Cox Media Group; John Esposito, Warner Music Nashville; Randy Goodman, Sony Music Nashville. Photo: CRB. Artist development and teamwork emerged as recurring themes during a presentation titled “New Views From the Top” at Country Radio Seminar (CRS) in Nashville on Monday (Feb. 8). The panel was intended to focus on the transition into new roles for the four participating executives: John Esposito (newly elected Chairman of the Board of the Country Music Association and President/CEO of Warner Music Nashville), Randy Goodman (Chairman and CEO, Sony Music Nashville), Bill Hendrich (Executive Vice President of Radio, Cox Media Group) and Rod Phillips (Sr. VP Programming, iHeart Country). Esposito: I knew I had to make some very tough decisions, and urgency for artist development was imperative if Warner was to rise out of the ashes and be a player in town. The good news is that people were very honest. I went out to country radio in the first 18 months and visited 85 stations. Because I knew I had to understand. People were blunt with me about what our failures were, and why our records were put on the bottom of the stack. I remember somebody saying to me, “I never even bothered because your regionals weren’t even going to call us.” So many things reminded me that in [spite of] having an A&R team being amazingly great, none of it mattered. That tenacity is imperative because you guys [in country radio] have to believe that we’re serious. We’re finding ways to tap into different assets other than just spins. Obviously spins matter a great deal to us, right? … We’re finding the larger chains wanting to have us get involved with them, particularly in social media, in such a way that helps the artist development story. I hate shuck and jive people, I really do. I think we’re getting to be a far more data-driven situation, on both sides of the situation, so it’s compelling information that we can give you that says there’s a reason why you should invest enough of your airwaves to give us a chance to find out if we have something [on a developing artist]. Goodman: It’s no secret that we [Sony Music Nashville] have had some struggles with artist development. I think that’s something that everybody is looking at us to see, are we going to be able to break out of that and really begin to break through some artists? And the artist development part of that has always been crucial because it’s about how you develop your roster—what’s next, and what your long-term needs to be. For us, it probably has a greater sense of urgency, because of the lack of that. You can only live so long on your superstars and your catalog until there’s a graying and a decay. If you don’t have those new artists to mitigate that decay, then you’re in a problematic situation. So the number one thing for us was taking a look at the roster and saying, “OK, how do we allow ourselves some more agility? How do we get into the marketplace quicker with some of the new things we were excited about?” So, the artist development thing has been a really crucial part of what we have to do with great urgency and we have to do that in the near term. I would say that for me, the great surprise and exciting thing was to walk in and find great people excited to do work. They wanted to be [allowed] to do what they were supposed to do. And to find things like Cam and Old Dominion there, and a great new Chris Young record, and a Carrie Underwood record to launch. I’ve used this term before, but there was a bit of an overgrown garden. If I’ve done anything, it’s pruning that garden so we can focus on those things that are showing promise and life. I think in this position, we could ask a group of the most influential people in the music business to sit down with us as a group, and drop our guard and have a conversation about how we can work together. How can we continue to promote the music out there? And how can we advance the career of new artists? I think we can bring those groups together. Whether we resolve anything or not, I think you can bring that group into the room and say, “Let’s look and see if we can come up with ideas that work for you, work for us, and work for the artist.” And if all three win, then the fans win. Phillips: As a company we have a large effort around being diverse and offering a lot for our partners, because we are a big platform and we do need each other. … Somebody’s got to be the biggest. We [at iHeart Radio] are certainly proud to be that, but oftentimes, and you’ll hear it from [iHeart Chairman and CEO] Bob Pittman on down, that we feel like it’s our responsibility to make sure that radio as an industry can grow revenues, and not just our company. Let’s call it what it is. We want to grow revenues faster than the others. That’s our job. But ultimately we actually want to bring more money to the sector. We still don’t get enough credit for what we do. I mean, 92-93 percent of Americans still tuning into radio on a weekly basis is absolutely spectacular. If you ask the average person with the rhetoric that’s out there, they might think that’s down to 70 percent. We are at the same percentage of impact that we were in 1970. It’s a phenomenal starting point.